This session took place in Parc Brebeuf in Gatineau on the Quebec side of the Ottawa River near Ottawa. I was wanting to obtain aerial shots of the city skyline with the Prince of Wales railroad bridge in the foreground. I also took shots of Lemieux Island from this location. These images were taken from a camera suspended below a kite (Kite Aerial Photography - KAP). Aerial View of Ottawa, Ontario. Panorama of stitched images. This image was taken from a camera suspended from a kite line, a method known at Kite aerial photography. 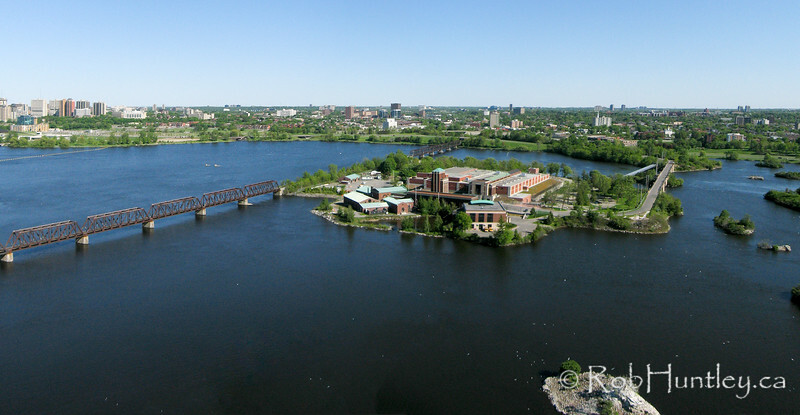 The KAP session took place at Parc Brebeuf on the Ottawa River, near Ottawa, Ontario.